I had the pleasure of photographing one of the most intimate weddings of my wedding career so far. 6 people - Yes! 6 people including the officiant, photographer, 2 videographers, and I, the photographer. It was so beautiful, so stress free, and so romantic, and in such stunning setting, that I will always remember it! Ryan proposed in the spring of 2014 when we were in Washington for the weekend visiting my family. We went out to Discovery Park in Seattle for a walk one morning, and every time we stopped to take in the view, I thought, "This is it! He's going to propose here!" - And he didn't! It wasn't until we were getting ready to leave that he finally gave me the ring. He knew I was anticipating it, and wanted me to be TRULY surprised! What was the vision for your wedding, the style/color/scheme? How many guests? The vision for our wedding can be summed up in one word - "SMALL." Neither Ryan or I had wanted a huge wedding, and we especially didn't want to get caught up in the whirlwind, we wanted the day to just be about us. It was difficult for us to pick just one or two people to join us for our ceremony, and we decided we would keep the day just to ourselves - no guests! So, I didn't have a style/color/theme at first! I found a gorgeous dress that fit my style and personality, and Ryan decided he wanted to wear a vest instead of a full suit. 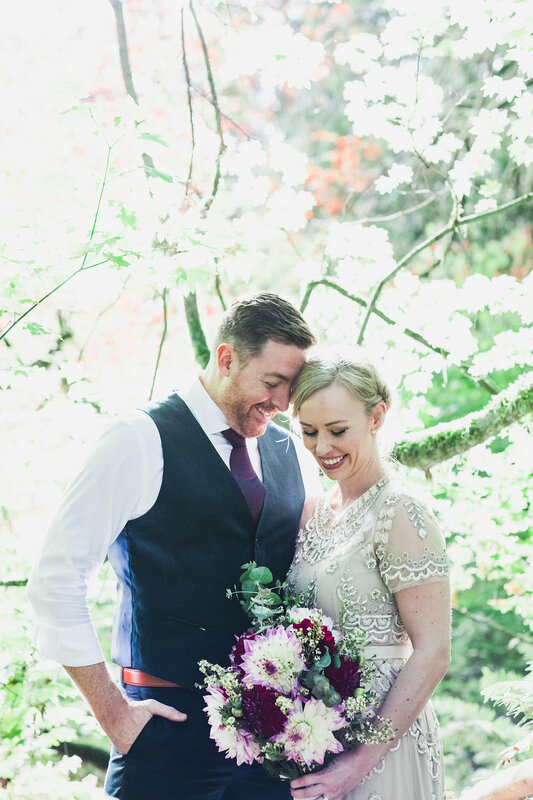 I think the only "color" I thought about was my lip color, I knew I wanted a berry color to contrast with the antique vibe of my dress, Ryan chose navy for his pants & vest, and when I thought about the deep green of the trees and the gold leaves, everything just went together in that jewel tone scheme. 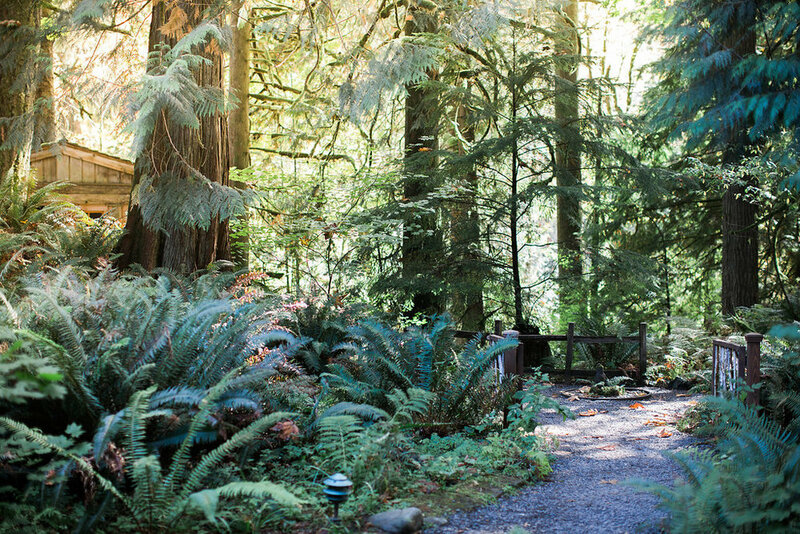 I chose our wedding venue because I knew I wanted to come back to Washington to be married. I grew up in Alaska, although most of my family lives in Washington, and Ryan grew up in Massachusetts. Needless to say, we both have a connection to nature and love being outdoors. We have spent the last six -- almost seven! -- years traveling and exploring the amazing landscapes everywhere we go. I found Treehouse Point by a random search on Pinterest, and knew it was THE place! 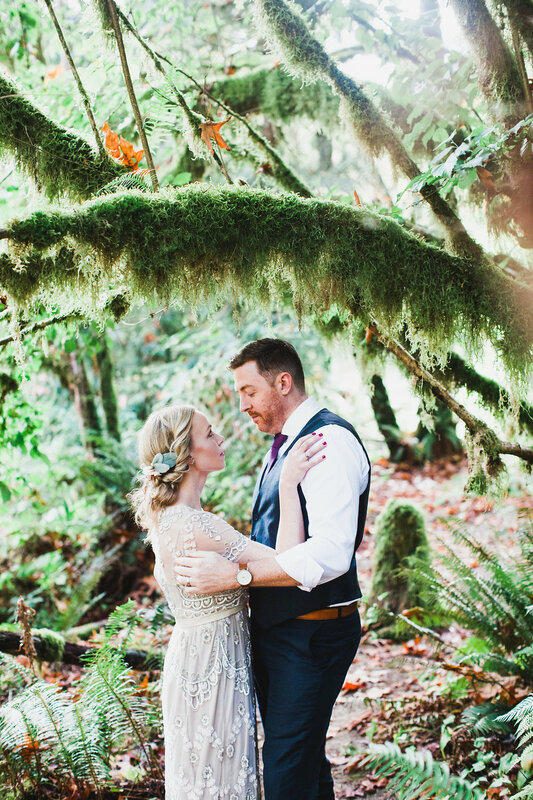 We could think of nothing better than to get married under gorgeous trees, on an amazing property, and spend some time hiking after our ceremony. 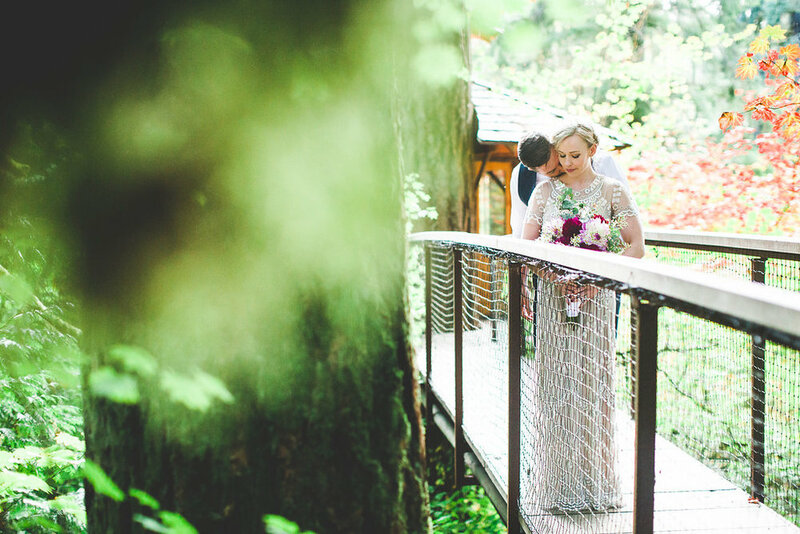 Treehouse Point has amazing wedding packages, but it turned out the smallest, simplest package was right for us. Describe the ceremony, what made it unique/special. The ceremony was very simple, as it didn't involve musicians, a wedding party, decorations, or any guests to worry about. The monstrous yellow leaves that had fallen on the lawn and the rustic arbor that Treehouse Point provided was all the decor we needed! 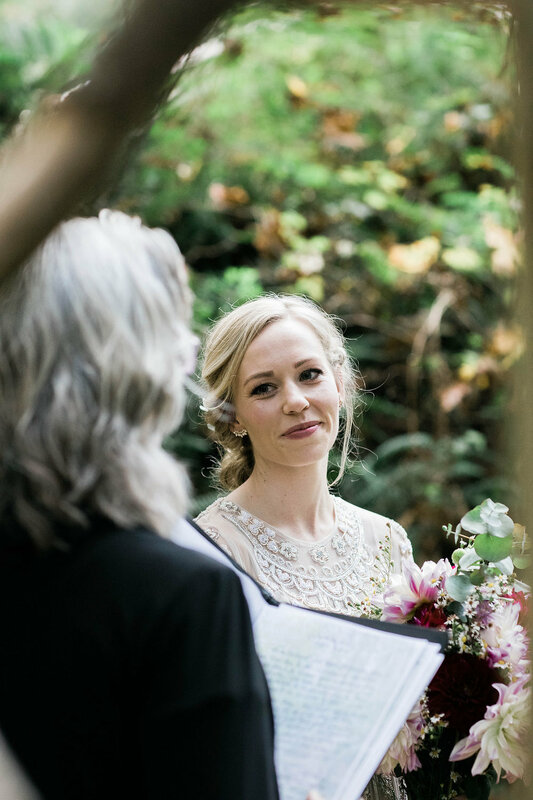 During our first conversation with our Officiant, Janet, I mentioned that it would be really special if she could incorporate a quote from Henry David Thoreau into the ceremony, "I took a walk in the woods and came out taller than the trees." Because, literally, that is what Ryan and I would be doing! She took that quote, read Thoreau's entire essay, "Walking," and linked his words to the sanctity of marriage. It was amazing! Neither Ryan or I are religious, so it was important to us to write our own vows that would capture how we felt about our relationship and what we wanted our marriage to represent. Ryan and I are both Scottish by heritage, and we found inspiration from traditional Celtic vows with Irish and Scottish influences. Our vows spoke of forgiveness, respect, and equality in our marriage. 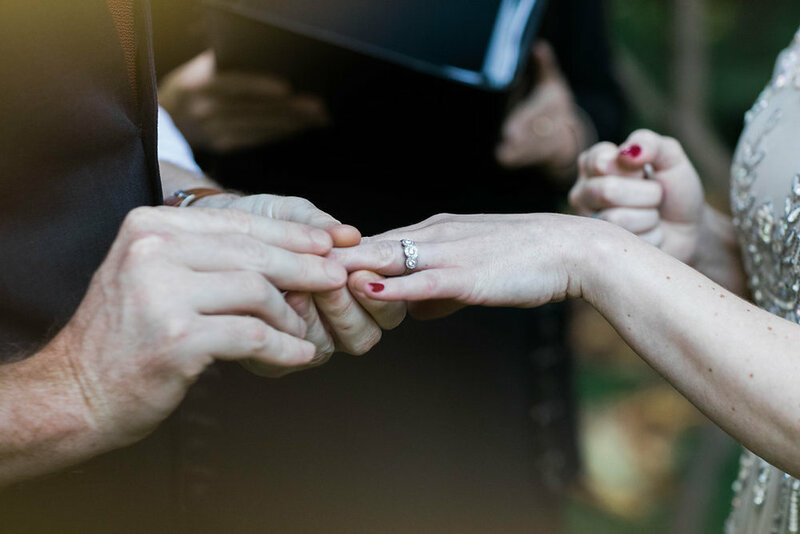 My favorite part of the ceremony was the end, when Janet wrapped our hands in a cloth in the Celtic tradition of "hand-fasting," which "bound" us together, our hands clasped in friendship and love. Describe the flowers used for floral arrangements. I knew I wanted something earthy and wild for my bouquet, so we went to Pike's Place Market the morning of the ceremony. I showed one of the flower vendors a picture I had found on Pinterest, and she went right to work! She had tons of greens, and dahlias in the most beautiful berry color, so I knew everything would tie in together. She did an amazing job! When Ryan and I first started dating, I was really into baking cupcakes. His birthday came around, and I decided to make him mint chocolate chip cupcakes to honor his favorite ice cream! It turned into a tradition, and every year for the last six years, I have made Ryan cupcakes of his choosing, even when he comes up with wacky flavors (blueberry muffin doughnut cupcakes for example). It was obvious we had to have cupcakes at our ceremony! We went to Cupcake Royale the morning of the wedding and selected a dozen cupcakes to bring out to Treehouse Point with us, we wanted enough to share with our photographer, videographers, and the staff at Treehouse Point! Flowers: Pike's Place Market; Cupcakes: Cupcake Royal; Dress: Needle and Thread from BHLDN; Shoes: Vince Camuto. Hair Accessories: Katie from ElevenSkiesStudio, Seattle WA. Jewelry: Earrings - Sole Society; Right Hand Ring - Jean from SilverSmack, Ironwood, MI. Groom’s attire: Nordstrom Men's Shop.